Railway Creek Farm: Heads Up everyone! Learn how to identify the leek moth. Heads Up everyone! Learn how to identify the leek moth. There are three flight periods of leek moth per season in Ontario. In Eastern Ontario, the insect can overwinter as an adult moth or as a pupa in various sheltered areas such as buildings, hedges and plant debris; field data collected in Ontario and Quebec have found the same. Adults become active and emerge in the spring, early April, when temperatures reach 9.5°C and mate shortly thereafter. Eggs are laid singly on lower leaf surfaces whenever night temperatures are above 10°C-12°C. Females lay up to 100 eggs over a 3-4-week period. When eggs hatch in approximately a week later, larvae enter leaves to mine tissues (leafminer stage). After several days, larvae move towards the centre of the plant where young leaves are formed. After several weeks of active feeding, larvae climb out onto foliage and spin their cocoons. Pupation lasts about 12 days, depending on weather conditions. 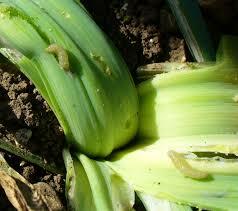 Leek moth numbers and associated damage typically increase as the season progresses. I find it best to start monitoring the garlic patch just before the scapes start to show way down in the in the middle of the plant. I look for frass, the aftermath that the larvae leaves behind after chewing its way into the plant, I will seek out the larvae and squish it with my fingers, one gross larvae at a time. It is best to get as many as you can in the first cycle in April/May in order to reduce the number of larvae survival to adulthood and avoid as many eggs laid in the second cycle. One adult can lay up to 100 eggs! OMAFRA publication from 2008 One of the first articles written by Jennifer Allen. Agriculture and Agri-Food Canada, recent article on Leek Moth, 2014.. There are excellent photos of leek moths, larvae, damage and pupae on this website.